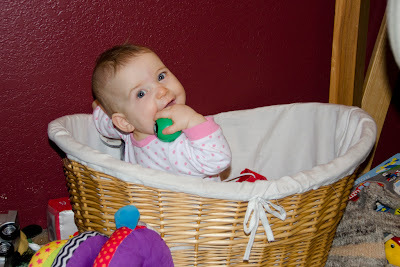 The girls are pulling up on things so much that in the past few days it seems any time I leave them in the living room for a few minutes I come back to find one of them in the laundry basket or toy basket. I think they stand up, lean over, and topple in. Sometimes there is wailing and sometimes, like this time, I just came back to find Hope happy as a clam in the middle of the toys!